Outpatient Services that offer hope and a comprehensive array of effective mental health services for those of all ages. Our clinic accepts and is in-network with most insurance companies, including Medical Assistance. Private pay and contractual agreements with counties are also accepted. 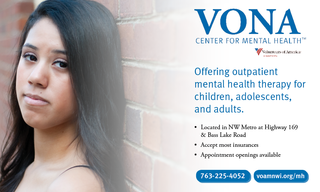 The Vona Center for Mental Health's multidisciplinary team of professional staff includes child and adolescent psychiatrists, licensed psychologists, clinical social workers, marriage and family therapists, mental health practitioners, and psychiatric nurse specialists. This is an in-depth examination that proceeds all clinical services, conducted by a mental health professional or mental health practitioner who is being supervised by a mental health professional. The purpose of this meeting is to understand an individual's current life situation, summary of personal life story, sources of stress, current functioning, current mental health symptoms/diagnoses, and history of mental health or chemical health problems. Preliminary screening can also be completed for cognitive impairment with recommendations for appropriate followup testing if necessary. Based on identified strengths and goals, the program therapist will summarize the findings and provide options for treatment, which may include one or more of the program services below. This is one-on-one "talk therapy" between participant and program therapist. Work within individual therapy is based on goals identified by the participant and program therapist and are geared toward promoting an individual's emotional well-being and stability. This is "talk-therapy" between participant, program therapist, and one or more members of the participant's family (ie. spouse, children, or grandchildren). Work within family therapy can be in conjunction with work in individual therapy and is based on identified goals to strengthen family interactions and the emotional well-being of all present. Psychiatric assessment, evaluation and services: A face-to-face interview with a psychiatrist for the purpose of assessing and diagnosing a person's current life situation, sources of stress, current functioning, current symptoms, history of mental health problems, and recommendations for the treatment, which may include medication treatment and/or psychotherapy. Medication management: Ongoing appointments with a psychiatrist to monitor the effectiveness of medication treatment. Psychological assessment and psychological testing: The use of tests to determine the status of a person's mental, intellectual and emotional functioning. A face-to-face interview with the psychologist is a component of any testing or assessment to validate the findings. Group psychotherapy: Psychotherapy provided by a mental health therapist for more three persons or more who because of the nature of their emotional, behavioral, or social problems can derive mutual benefit from interaction in a group setting. Home-based services: Intensive mental health services provided to children with significiant emotional/behavioral concerns, who are at risk of out-of-home placement or who are returning to the community from out-of-home placement. This intensive mental health service package includes skills sessions for the individual, family skills sessions, individual therapy and family psychotherapy. The selection of the components and the frequency of services are determined by a diagnostic assessment and individualized treatment plan. DBT Intensive Outpatient Services: Dialectical Behavior Therapy (DBT) Services for the multi-diagnostic, difficult to treat, significant emotional/behavioral dysregulation patterned adolescent participant who may have borderline traits, or an emerging personality disorder. Weekly services include DBT Individual Therapy with phone coaching and individual skills training. Services are provided by DBT qualified, trained and experienced mental health professionals and practitioners.